My first experience swimming with dolphins was during a 1990 vacation after a spontaneous invitation by two women who swam with this wild pod regularly in a bay south of Kona, Hawaii. I was in the right place at the right time! Finding myself afraid to come too close to them, the dolphins' sounds helped me let go of my fear and delight in their presence. I still feel nourished by my memories of this encounter. Living in Santa Cruz, California for 20 years, I loved when dolphins showed up in the Monterey Bay while I walked along the shore. After a two year leave from Santa Cruz, I returned and ventured out with a friend on boogie boards on a strong surf afternoon. Recent unfamiliarity with the Pacific waves brought concern. Heading to a safer area before surfing waves, my dolphin friends showed up to comfort me! 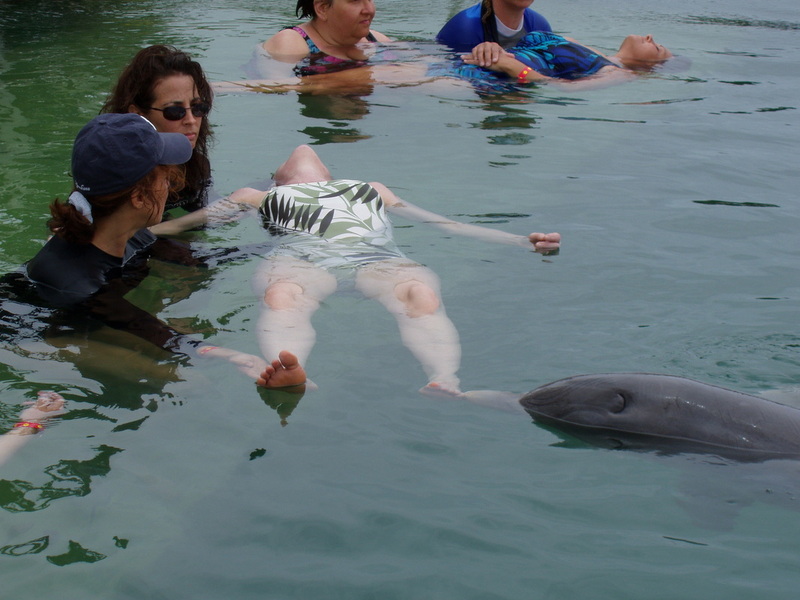 In 2005 I had the privilege of working with trained dolphins in the Bahamas (who have access to the open ocean) as part of the Upledger Institute Advanced CranioSacral Therapy BioAquatic Workshop. Working in teams, we treated colleagues with the voluntary help of three dolphins as our "lead therapists" and experienced the wisdom of these beings and the complementary team work. My participation in treatment with these dolphins and my colleagues brought profound release and joy. Following this exquisite experience, I connected with two research dolphins named Primo and Puka in Santa Cruz at the Long Marine Lab at UCSC. Resolved to living in a pool now, they seemed grateful to receive my empathy as one of the many guests at the center. Communicating intuitively, early on I asked Primo for a sign he was listening, and he jumped up high to the crowd's delight! While visiting my dolphin friends quite regularly, our bond began extending beyond our visits to one or both of them showing up in my awareness during certain CranioSacral Therapy sessions. While I was at my client's head, Primo would be at the base of their spine or along their side, helping influence the release, often with a "lighten up" attitude. Some of these clients got to know Primo as one of their own helpers. Children love to play with the stuffed animal dolphins that live in my office studio, or to pretend to be part of a dolphin pod with me and Mom, connecting with their fluidity to influence their fluid craniosacral system. With my guidance, some adults access dolphin helpers to assist them with their treatment or in their lives, in a particular way. Everyone is invited to join the trained dolphins in Freeport, Grand Bahama Island as part of the Upledger Institute Dolphin Assisted Therapy Intensive Program. You have the option of me as your support therapist, if we work together prior. A wonderful experience in general, it is most beneficial for those who have hit a plateau with health improvement or for those who wish to delve into their release process in this containment away from life at home. 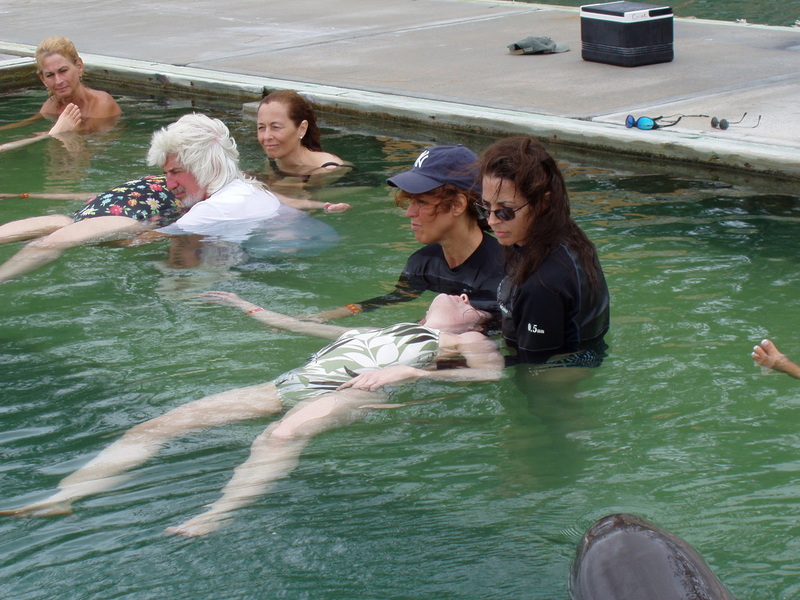 You, too, may have the opportunity to hug a trained dolphin as part of your intensive program! You, too, may experience the joy of a dolphin connecting directly with you as one of your therapists. They know where to contact you to influence your most beneficial release, and when to influence indirectly by swimming nearby you. You, too, may feel the power of their sonic sound waves emitting through your body, facilitating your release, physical and perhaps emotional.